Updated 2/24/2017: It has been far too long since I have taken the time to update this website! Dad’s logbook continues to be found and I continue to receive emails and messages from around the world, although not as many as in the past. I still enjoy receiving emails and comments so feel free to touch base. As I have said before, it is still extremely gratifying to know that this one little website has been seen by so many and has made such an impact. Dad never did quite understand why anyone would care about his experiences! 75 years later and my dad’s logbook continues to be relevant, interesting, and current! Unfortunately, since the time of the last update, the 379th Bomb Group Association, a group of veterans and first generation family whose mission it was to keep the memory of the 379th alive, has ceased to exist. As the years and veterans pass, membership and funding dwindled. Luckily, I was able to attend their last reunion in Nashville, Tennessee in September 2014. As you can imagine, it was an emotional experience. The Association donated its relics and memorabilia to the National Mighty Eighth Museum outside of Savannah, Georgia. A copy of the book my sister made with scans of Dad’s logbook now resides there. If you enjoy this website, please consider donating the the National Mighty Eighth Museum. The museum is a 501(c)(3) charitable organization and your donation is tax-deductible to the extent allowed by law. ALL monies go to the museum. I do not receive income from this website. It is a labor of love. John McDowell. Van Nuys Ca. Your Father is a great American. Thank you for your comment John. As you know, those who fought during the War don’t consider themselves heroes – they were just doing a job for their country. I’ll pass along to my father that his website has generated another comment. He’s always so surprised that so many still find interest in World War II. a couple of years ago I had an opportunity to review my uncles military record that he had copy of. 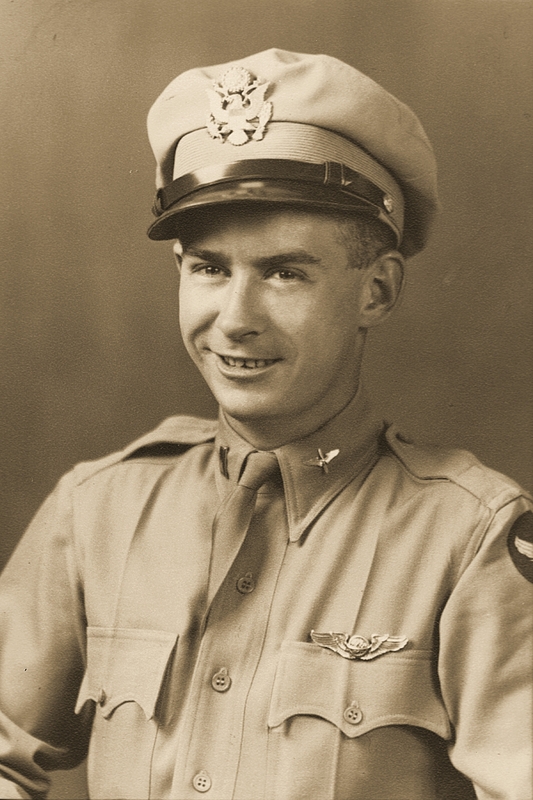 The local paper interviewed and did a veterans day spread on my Uncle James W. Dodson, B-17 Pilot/copilot. Your father flew with my uncle during the war and I’m so sorry for the loss of your father, a great American. It has been great to listen, hear and read their stories. A lot of these true Americans who fought for our freedom, stories go undocumented. We were very fortunate that our love ones returned from the war, where we lost so many. God bless you for sharing your fathers log book and stories. James, OMG! This is amazing! I apologize for not seeing your comment sooner. A technical glitch not discovered until today (read that as “I forgot to make a password change update in another spot”) kept me from seeing comment notifications. I’m glad you were able to find my website! I am hoping to add more to it, but never seem to find the time. I’ll make it a priority this winter. Easier when the nights are long and cold. Please do keep in touch! And, is it true your uncle is still alive? I have another comment from a Larry L Smith stating he is your uncle’s caretaker and wants more photos and stuff to share? Send me email at missy.b17navigator@gmail.com…missy. Ms Hart, I am trying to find a successor to the 379th Bomb Group that disbanded in 2014. Hi George! I am not Ms. Hart, but I know who you speak of. As far as I know, there is no successor to the group. The Association’s website still exists and I believe they still take “Looking4” requests, but as for reunions, those no longer occur. I’m sorry that it has taken me so long to respond to your comment. I never received notification. 😦 Is there a specific reason why you are looking for the group?